British Prime Minister Theresa May on Wednesday expelled 23 Russian diplomats and suspended high-level contacts including for the World Cup, saying her government found Moscow “culpable” of a nerve agent attack on a former spy. May said she would be pushing for a “robust international response” when the UN Security Council meets later Wednesday in New York to discuss the attack on Sergei Skripal and his daughter on March 4. Russia has repeatedly denied any involvement and its London embassy warned that May’s response was “totally unacceptable and shortsighted”. May told parliament that Russia had failed to respond to her demand for an explanation on how a Soviet-designed chemical, Novichok, was used in the English city of Salisbury. “There is no alternative conclusion other than that the Russian State was culpable for the attempted murder of Mr Skripal and his daughter,” she said. In measures drawn up at a meeting of her national security council earlier Wednesday, May announced that 23 Russian diplomats believed to be undeclared intelligence officers must leave Britain in a week. She suspended all planned high-level contacts, which includes revoking an invitation for Foreign Minister Sergei Lavrov to visit but said she did not want to break off relations entirely. May also confirmed that neither members of the royal family or ministers would attend the football World Cup in Russia later this year. And she outlined fresh measures against people travelling to or living in Britain who were responsible for violations of human rights or planned “hostile activities”. NATO allies, including the United States, have expressed their support for Britain following the first offensive use of a nerve agent in Europe since World War II. Along with the UN Security Council meeting in New York, EU Council President Donald Tusk indicated that the issue would be on the agenda of next week’s summit of the bloc’s leaders in Brussels. 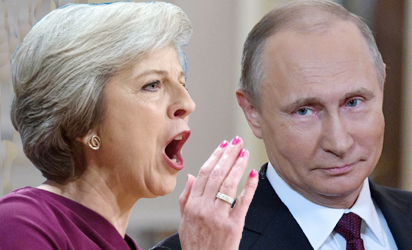 The post Britain expels Russian diplomats, orders World Cup snub appeared first on Vanguard News.